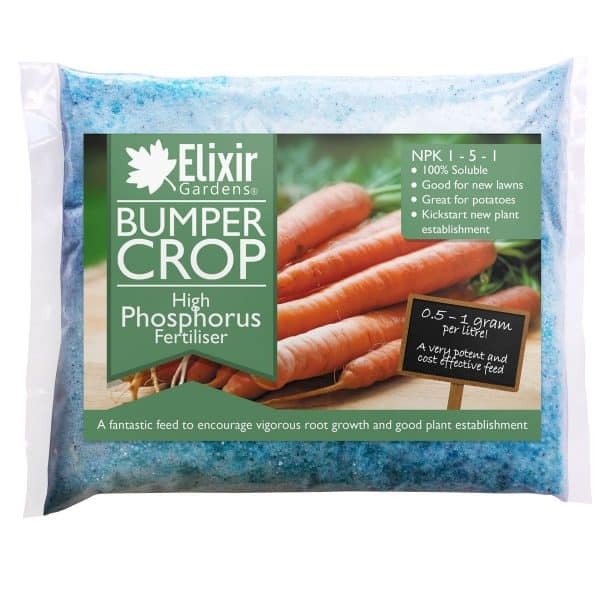 A great high phosphorus feed to encourage vigorous root growth and good plant establishment. 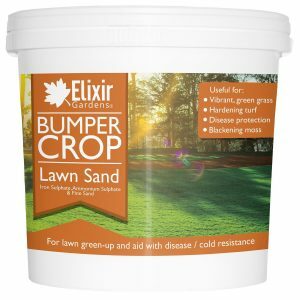 Use early in the season when plants are young. 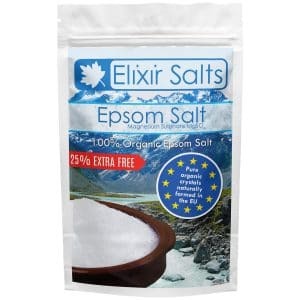 • Completely and readily soluble, even in cold water! • Includes the chelated micronutrients Magnesium, Iron, Zinc, Copper which are vital for quality plant development is incorporated into the fertiliser to ensure stable solutions and ready availability to the plant. • To promote flowering and subsequent fruit production. 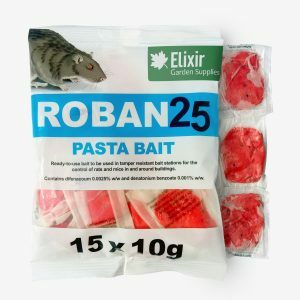 Improves flavour and increases sturdiness of plants and shelf-life of fruit. 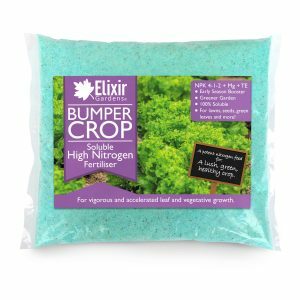 Use from the onset of flowering until harvest time. • Apply at only 0.5 – 1 gram per litre! A very potent and cost effective feed that will last you a whole season from a small amount! 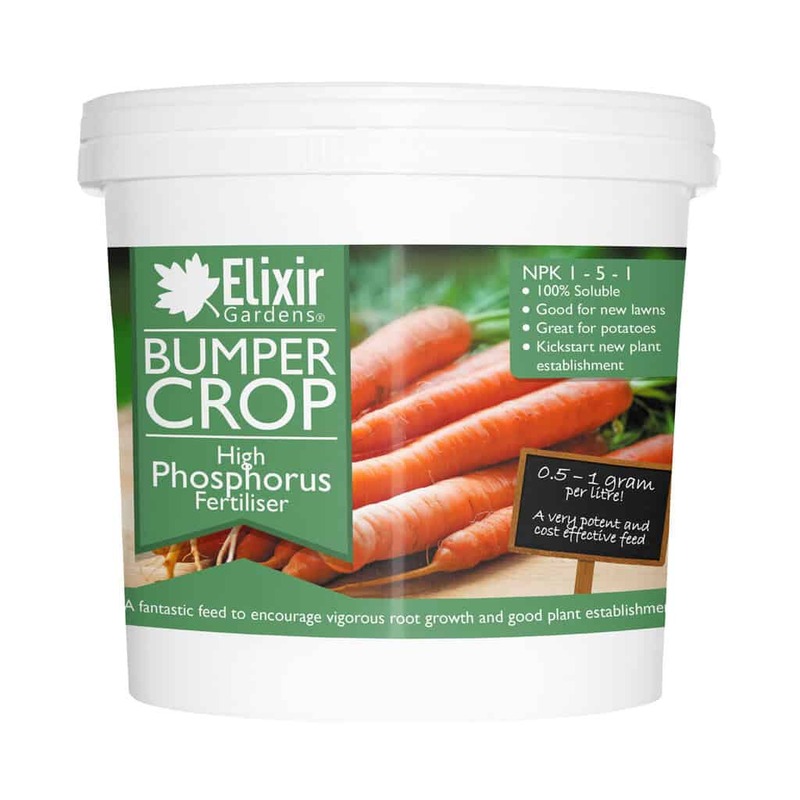 Potassium is an essential plant nutrient and is required in large amounts for proper growth and reproduction of plants. Potassium is considered second only to nitrogen, when it comes to nutrients needed by plants, and is commonly considered as the “quality nutrient.” It affects the plant shape, size, colour, taste and other measurements attributed to healthy produce. Use to encourage vigorous root growth and good plant establishment. 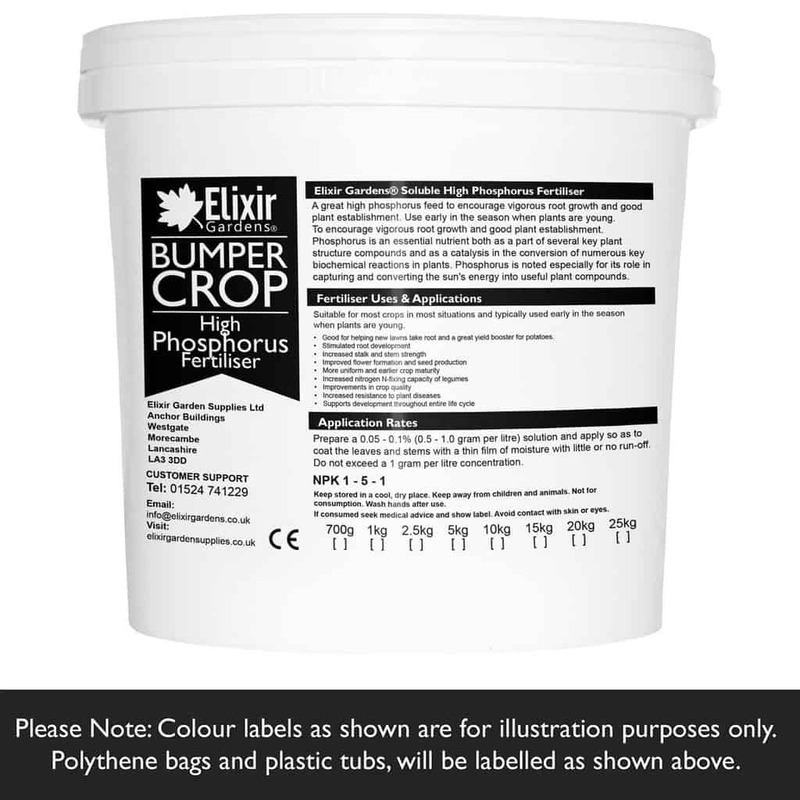 Suitable for most crops in most situations and typically used early in the season when plants are young. 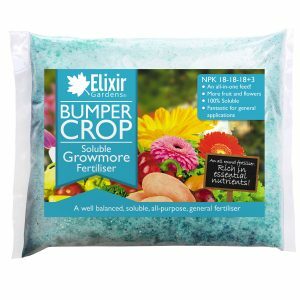 Good for helping new lawns take root and a great yield booster for potatoes. 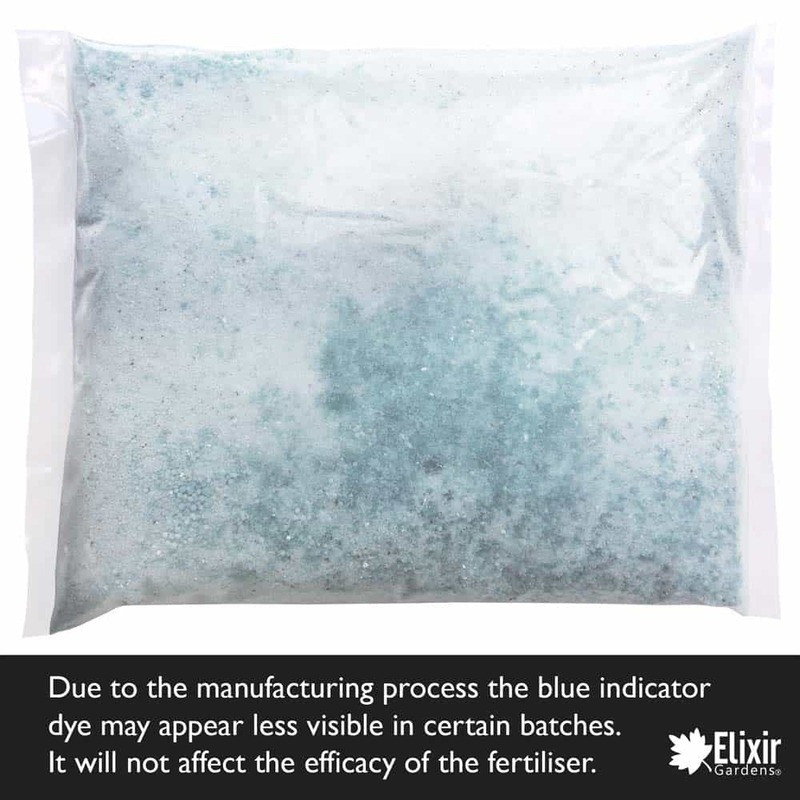 Prepare a 0.05 – 0.1% (0.5 – 1.0 gram per litre) solution and apply so as to coat the leaves and stems with a thin film of moisture with little or no run-off. Do not exceed a 1 gram per litre concentration. 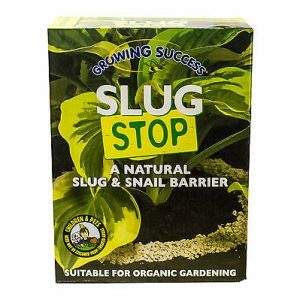 To encourage vigorous root growth and good plant establishment. 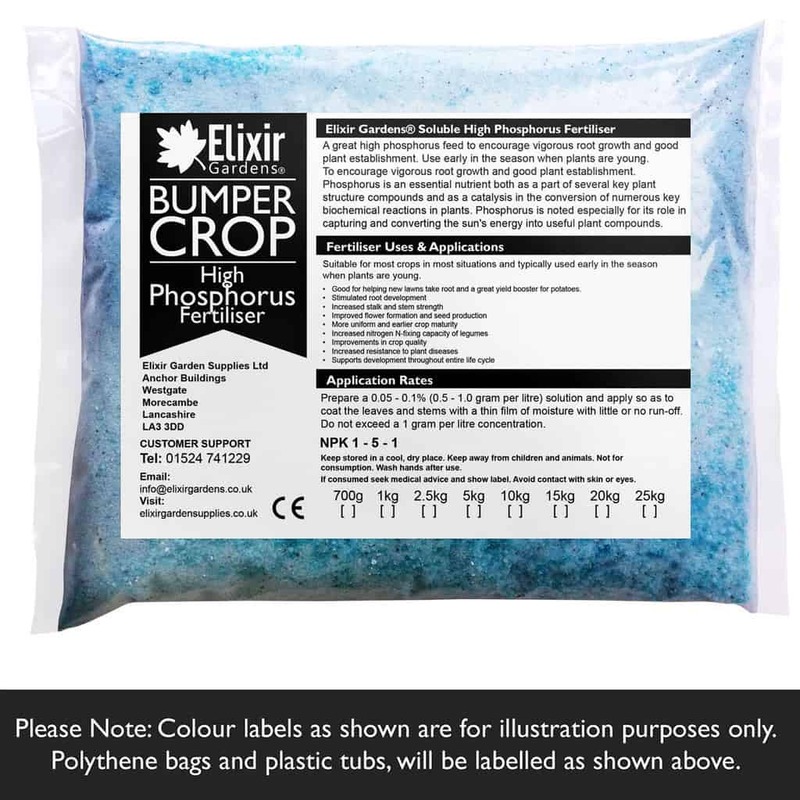 Suitable for most crops in most situations and typically used early in the season when plants are young. The sprayer should be fitted with a nozzle(s) that produce a fine mist. Only sufficient spray solution should be applied to coat the leaves and stems with a film of moisture with little or no “run off”. Spraying should be carried out on a calm day BUT NOT DURING STRONG SUNSHINE OR HIGH TEMPERATURES. The best time is late afternoon or evening. If rain is imminent, spraying should be postponed. If rain falls within 4 hours of spraying, the crop should be re-sprayed 3 or 4 days later. For application via hose-end diluters, please refer to the device manufacturer’s directions for use.